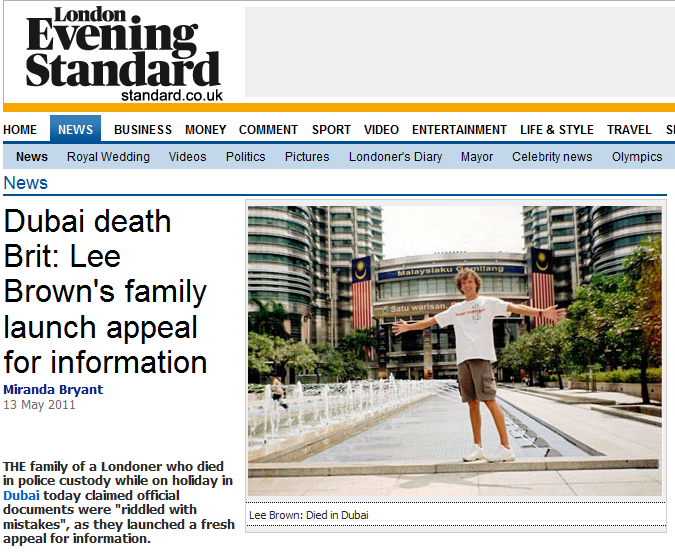 Family of Lee Bradley Brown, beaten to death in Dubai April 2011 said, Dubai officials got his age wrong and put the incorrect date of death on the death certificate. This entry was posted on May 16, 2011 at 00:34	and is filed under Dubai Police, Lee Bradley Brown Dubai. Tagged: Britsih Tourist died in Dubai, Dubai Prison, Lee Brown Dubai Police. You can follow any responses to this entry through the RSS 2.0 feed. Both comments and pings are currently closed.